Natural ingredients can soothe sunburn. For those looking to treat a severe sunburn, old-fashioned remedy may not be the first treatment option that comes to mind. There are several medicated sunburn sprays available over the counter, but many have found that these chemicals can be harsh on tender and damaged skin. Often the best cure for a severe sunburn, old-fashioned remedy like oatmeal may do the trick. Oatmeal may be nature's perfect grain. Not only is oatmeal delicious as a meal, known to help lower cholesterol and prevent heart disease, but it can also soothe damaged or irritated skin and serve as a wonderful exfoliating at-home facial mask. When it comes to soothing the skin and offering relief from itch, whether that be from mild eczema, bug bites, or poison ivy, oatmeal can't be beat. Add to the marvelous remedies of oatmeal the ability to soothe severe sunburn, and you've got a natural chemical free product that belongs in every medicine cabinet or pantry. To treat severe sunburn with oatmeal, cook oatmeal as directed on the package. Add a little more water than indicated to make a runnier consistency. Allow oatmeal to cool completely. Apply liberally to damaged skin, careful not to "rub in' the oatmeal, as it can act as an exfoliant removing the damaged skin before it is ready. 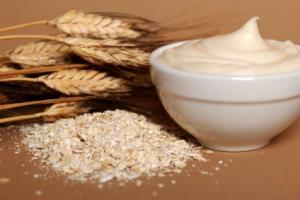 Leave oatmeal on the skin until desired level of relief is obtained, and rinse off with cool water. Reapply as often as needed, do not reuse the oats. There is also an over the counter oatmeal product available. Aveeno skin care is available in the health and beauty section of most grocery stores and pharmacies. Oatmeal infused products such as mild cleansers and bath soaks may offer the same relief of shelf oatmeal without the mess. While oatmeal can soothe the burn, relieve the pain and aid in the healing of sunburned skin, there are many other old-fashioned remedies that can offer instant relief. Another pantry staple, black tea can aid us in many ways. Perfect for treating puffy eyes and as an alternative to coffee, black tea is rich and full of antioxidants. Pack your pantry with a few bags of black herbal tea and discover the natural benefits. To treat irritated and damaged skin, soak several black tea bags in cool water and allow the tannin to release. When the water darkens, the tea-infused water and the bags are ready to treat your ailments. To use, lay the cool, wet teabags on the burned skin for a period of ten to twenty minutes. You may also soak a cloth into the tea infused water and pat onto the sunburned skin. Black tea will remove the heat, pain and sting of your skin, all while leaving a toasty warm glow, which is much more favorable than the reddened, irritated skin. Old-fashioned sunburn remedies wouldn't be complete without aloe vera. Many people living in coastal communities grow aloe vera knowing that their natural soothing abilities will come in handy during the heated summer months. Aloe is a succulent plant and is very easy to grow, perfect for a sunny windowsill or Zen garden. When it comes to treating a sunburn, rip off a chunky stalk of your aloe vera plant, tear open the juicy leaf, and apply the live aloe directly onto the burned skin. If you do not have a live aloe plant at your disposal, aloe vera gel is available on grocery and pharmacy shelves worldwide. Pick up a bottle and leave it in you medicine cabinet year round for treatment of first degree burns and sunburn. If you're searching for additional old-fashioned treatments to help sunburns, seek the help of an herbalist or homeopathic specialist who probably has a shelf full of ancient treatment recipes. Vitamin E gel caps, salt water, white and apple cider vinegar, as well as baking soda have been known to help soothe and heal sunburn naturally. Natural sunburn remedies are perfect for everyone, especially young children who should avoid chemicals and topical treatments. It's best to immediately stop the use of perfumed fragrant lotions, oils or chemical products throughout the healing process, as they can contribute to the uncomfortable pain, stinging and irritation that accompanies severe sunburn.